This brake vehicle came to the SVR after an illustrious career as the main line support vehicle for preserved King Class GWR 4-6-0 No 6000 King George V.
Based at Hereford, it ran many excursions with 'KGV' and took part in numerous open days at the Bulmer Steam Centre. With the removal of the loco to the National Collection, the need for the support coach was over. The steam centre closed, and several of the volunteers came to the SVR, and brought 35219 to live here. Repairs at Kidderminster Works were needed to make it fit for service, and 35219 entered traffic still in its fading 6000 Locomotive Association maroon. Following legal searches for donors to their defunct fund, the 6000 LA vested ownership of 35219 with the SVR Rolling Stock Trust. 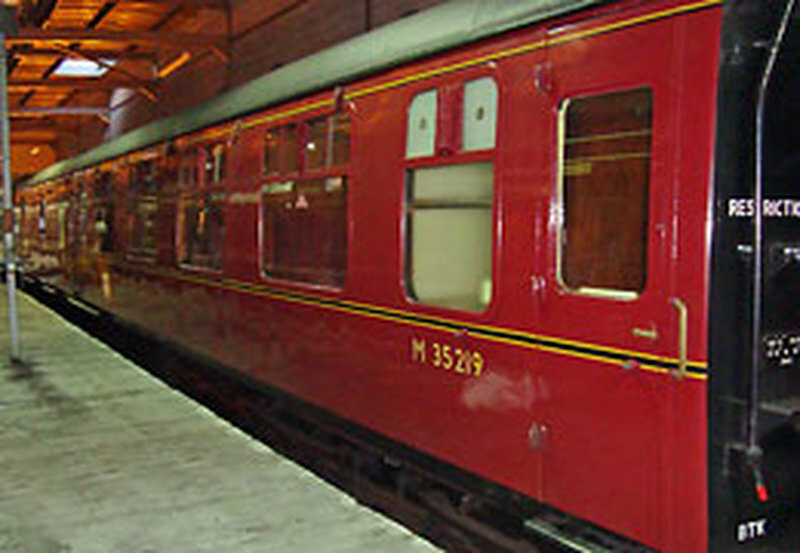 Shortly afterwards, the worn upholstery was replaced with replica BR/LMS pattern cloth in 2006. Within six months, 35219 was then put through Bewdley Bodyshop for further repairs, and a full repaint into BR 1958 maroon livery. The passenger accommodation comprises 24 seats in three a side formation in four compartments. The guard has hiw own well-equipped compartment, with a swivelling bucket seat, pie-warmer, radiator with tea-can holder, sawdust box for spillages, and lockable desk with letter rack. An emergency wrecking kit is provided in the corridor wall, and this was fully stocked up at Swindon for the 6000LA when the coach went there for attention shortly after purchase. 35219's large luggage cage is very useful on SVR services when it gets loaded with buggies on 'Santa' and 'Thomas' services. 35219 visited the SVR several times with 'KGV' in the 1970s on excursions with the Bulmers Cider Train. Though registered as a main line support coach, 35219 is unlikely to go touring again, as it is a vacuum brake only example, and dual or air braked vehicles are now required for a main line ticket.